Can someone please help me? I'm on a PC. Hello and welcome alphabetagamma mate what are you trying to connect to? a wifi modem / router? Ok mate so do you have the network symbol in the notification area? 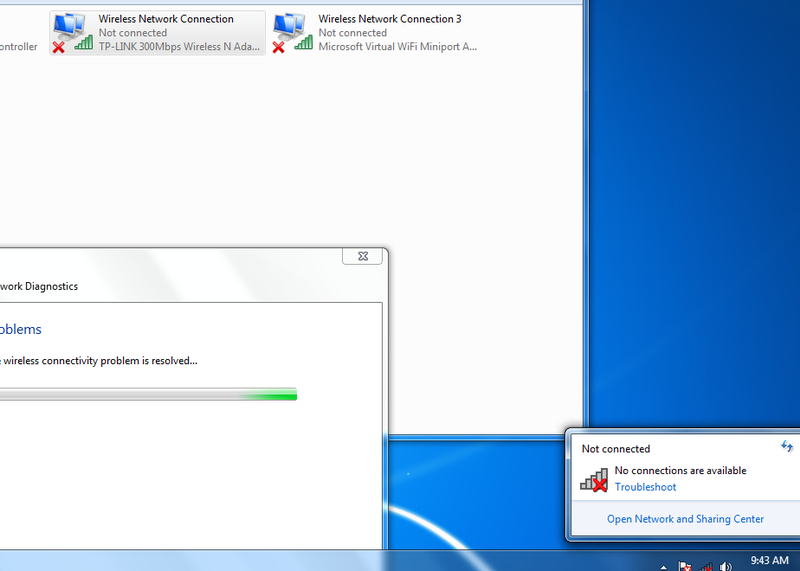 see pic if so click on it and it should open up a window with available networks listed in it. Now if you have a modem you regularly use click on that one and clcik Connect - it should then ask for the password unless you have connected before and it would have been saved by your system. I know what it is it just says that there are no connections available even though there are at least few free wifi networks (in my neighborhood) that my smartphone can pick up, but something is wrong with probably the configuration of my wifi adapter. OK lets have some system specs now because I agree the network card or adaptor is obviously not up to scratch. So please follow this - I should have asked earlier because really it is very hard to work without knowing what one is working with. I used the driver files from the CD it came with and the link you provided. None of them worked. So two things mate I think I asked earlier a) do you have a wifi modem/router? and b) is there a yellow triangle next to the TP-Link adaptor? If you have a modem/router then what brand and model is it?? Edit I have just thought too I am assuming too that you have unhooked the Ethernet cable you say you have running? USB WiFi Adapter - Built-In Win7 Drivers?